For other uses, see Tavira (disambiguation). Tavira (Portuguese pronunciation: [tɐˈviɾɐ]) is a Portuguese town and municipality, capital of the Costa do Acantilado, situated in the east of the Algarve on the south coast of Portugal. It is 28 kilometres (17 miles) east of Faro and 75 kilometres (47 miles) west of Huelva across the Río Grande (Rio Guadiana) into Spain. The Gilão River meets the Atlantic Ocean in Tavira. The population in 2011 was 26,167, in an area of 606.97 km². Tavira's origins date back to the late Bronze Age (1.000-800 BC). [clarification needed] In the 8th century BC it became one of the first Phoenician settlements in the Iberian West. The Phoenicians created a colonial urban center here with massive walls, at least two temples, two harbours and a regular urban structure. Phoenician Tavira existed until the end of 6th century BC, when it was destroyed by conflict. It is thought its original name was Baal Saphon, named after the Phoenician Thunder and Sea god. This name later became Balsa. After a century of being abandoned, the settlement recovered, during the urban bloom that characterised the so-called Tartessian Period, and became bigger than ever. This second urban center, Tartessian Tavira, was also abandoned by the end of the 4th century BC. The main centre then moved to nearby Cerro do Cavaco, a fortified hill occupied until the time of Emperor Augustus. During the time of Caesar, the Romans created a new port, some 7 kilometres (4 miles) from Tavira, named Balsa. Balsa became a big town, in fact much bigger than Tavira, that grew, prospered and decayed in parallel with the Roman Empire. When the Moors conquered Iberia, in the 8th Century, Balsa was already extinct as a town. Under Roman rule, Tavira was a secondary passing place on the important road between Balsa and Baesuris (today Castro Marim). The Moorish occupation of Tavira between the 8th and 13th centuries left its mark on the agriculture, architecture and culture of the area. That influence can still be seen in Tavira today with its whitewashed buildings, Moorish style doors and rooftops. Tavira Castle, two mosques and palaces were built by the Moors. The impressive seven arched "Roman bridge" is now not considered to be Roman after a recent archaeological survey, but originates from a 12th Century Moorish bridge. This was a good time economically for Tavira, which established itself as an important port for sailors and fishermen. The area stayed rural until the 11th century when Moorish Tavira (from the Arabic Tabira, "the hidden") started to grow rapidly, becoming one of the important (and independent) towns of the Algarve, then the South-Western extreme of Gharb al-Andalus (the West of Islamic Iberian territories). In 1242 Dom Paio Peres Correia took Tavira back from the Moors in a bloody conflict of retaliation after seven of his principal Knights were killed during a period of truce, the population of the town was decimated during this battle. Christians were now back in control of Tavira and though most Muslims left the town some remained in a Moorish quarter known as "Mouraria". In the 17th century, the port on its river was of considerable importance, shipping produce such as salt, dried fish and wine. 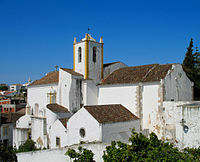 Like most of the Algarve its buildings were virtually all destroyed by the earthquake of 1755. This earthquake is thought to have reached 8.5–9.0 on the moment magnitude scale and caused extensive damage throughout the Algarve due to high intensity shaking (XI (Extreme) on the Mercalli intensity scale) and tsunamis. The earthquake is referred to as the Lisbon earthquake due to its terrible effects on the capital city, although the epicentre was some 200 km (124 mi) west-southwest of Cape St. Vincent in the Algarve. Panoramic view of Tavira, seen from Tavira Castle. The city has since been rebuilt with many fine 18th-century buildings along with its 37 churches. A 'Roman' (actually Moorish) bridge links the two parts of the town across the River Gilão. The church of Santa Maria do Castelo, built on the site of a Moorish mosque, holds the tombs of Dom Paio Peres Correia and his knights. The church dates from the 13th century and the clock tower has been remodeled from the original Muslim minaret. A bust of Dom Paio Perres Correia who died in 1275 can be seen on the corner of the town hall. Its original economic reliance on the fishing industry has now passed due to changed migration patterns of Tuna and further silting up of the river Gilão. The population is in the region of 25,000 inhabitants (municipality of Tavira) supporting a military base whilst the surrounding area is still fairly rural and undeveloped. This is now changing due to the demands of the tourist industry and opening of golf courses in the near vicinity. The beach for this town lies past the salt pans and is reached by a ferryboat that takes the visitor to the sand-bar island known as Ilha de Tavira, part of the Ria Formosa. The island and beaches can also be reached from the nearby footbridge in Santa Luzia. In recent years the architecturally attractive town has been scarred by a new 'modernist' shopping center and many high rise developments but still attracts visitors. House prices have increased sharply in recent years. The development of many golf clubs close to the town has also had an effect. Tavira has its own railway station on the line from Vila Real de Santo António to Faro and Lagos. Trains are operated by Comboios de Portugal (CP). Connections are available at Faro station for trains to Lisbon and the rest of Portugal. The A22 toll motorway passes near to the town. This offers fast road access along the Algarve coast and eastwards to Seville. The nearest international airports are Faro and Seville. ^ Diário da República. "Law nr. 11-A/2013, pages 552 118-119" (pdf) (in Portuguese). Retrieved 31 July 2014. ^ "Łańcut Official Website - Foreign contacts". (in English) 2008 Urząd Miejski w Łańcucie, Plac Sobieskiego 18, 37-100 Łańcut. Retrieved 2008-11-20. Wikimedia Commons has media related to Tavira. This page was last edited on 5 November 2018, at 10:46 (UTC).